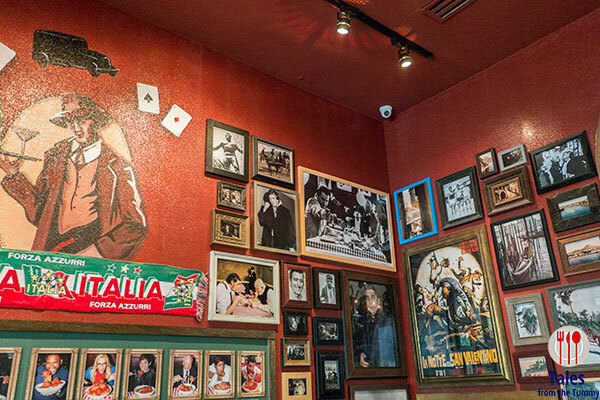 Buca di Beppo is an Italian-American restaurant chain from the Planet Hollywood group in the USA with over 100 branches. 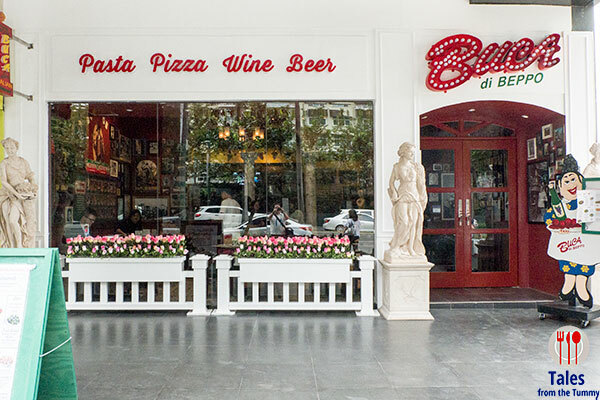 The first Philippine restaurant was recently opened in BGC by the Sbarro group and is located at the BGC Corporate Center, the building across Seda Hotel and Serendra 1, which also has Tomatito and a Starbucks. There’s parking available in the building itself as well as open parking lots at the back. 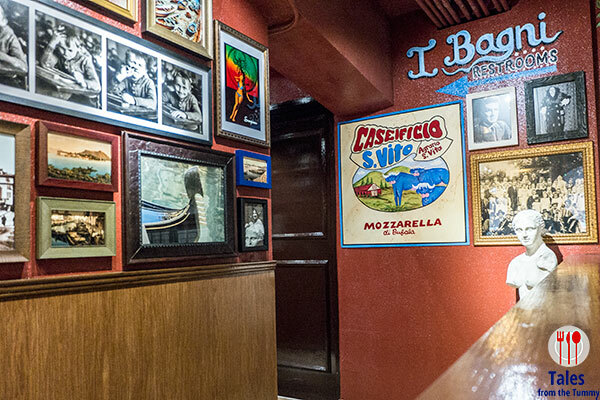 Once you pass through the doors of Buca, you will feel like you’ve been transported to Little Italy with different themed seating zones like the gangster area with different pictures of famous mafia personalities. 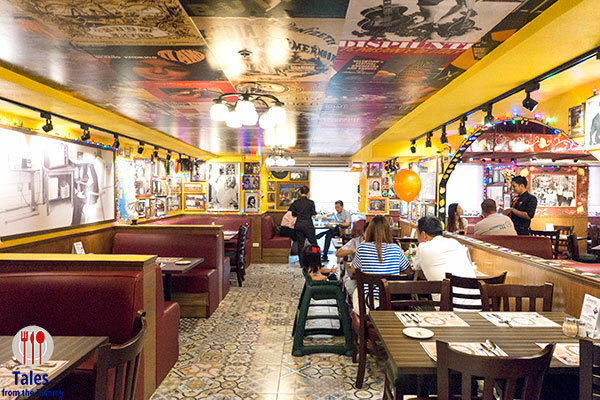 or the poster room with all walls and ceilings covered in posters. 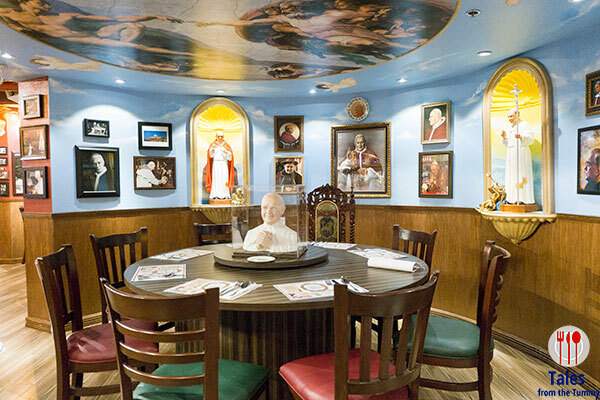 The most interesting seating area is the pope table, quite an experience to have your meal surrounded by religious icons including a bust right in the middle of the table. The menu is straight up Italian-American, I was even imagining an Italian nonna in the kitchen with vats of different sauces. The 2nd floor open kitchen debunked my wild imaginations though as you can clearly see the army of chefs in the kitchen whipping up dish after dish. 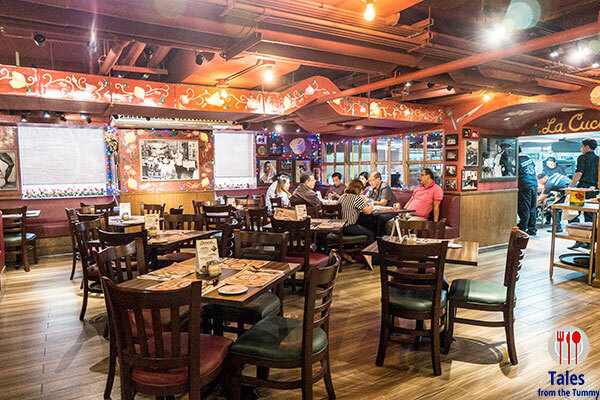 All dishes in Buca di Beppo are meant to be shared and are usually available in S (1-2), M (3-5) and L (6-7) sizes. 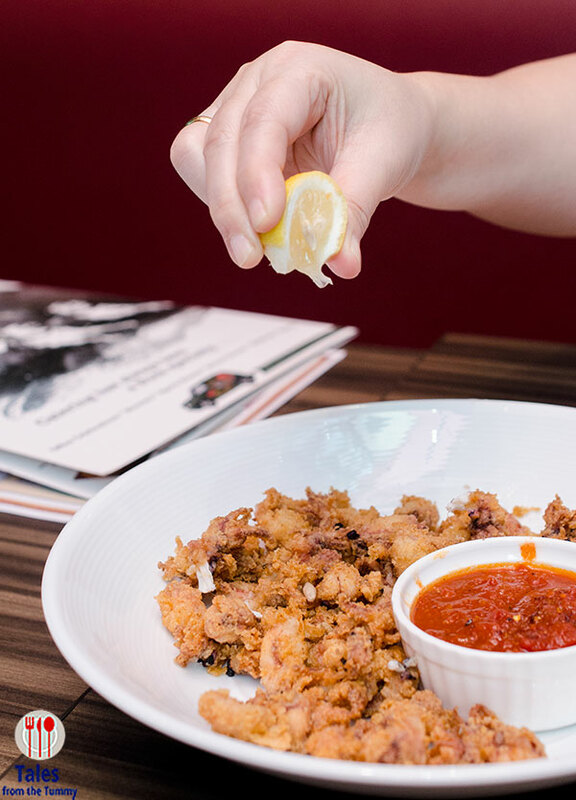 We started off with Fried Calamari (P485/medium), baby squids lightly battered and served with a spicy marinara sauce. I loved the calamari, they were soft and juicy with lots of sweet flavors, even the chef admitted that the calamari is better here because they are able to use fresh seafood. Apple Gorgonzola Salad (P855/small). 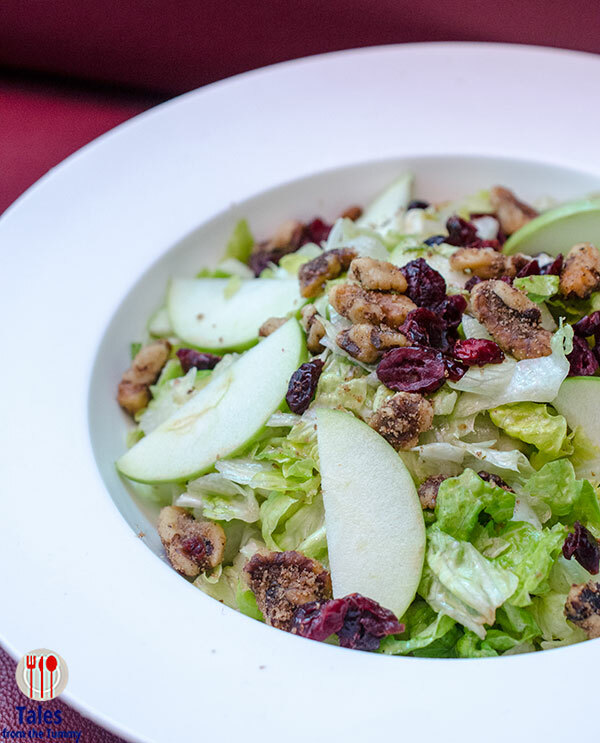 Mixed greens with Granny smith apples, spiced walnuts, dried cranberries, and Gorgonzola tossed in Italian dressing. Spaghetti with Meatballs (P575/small). 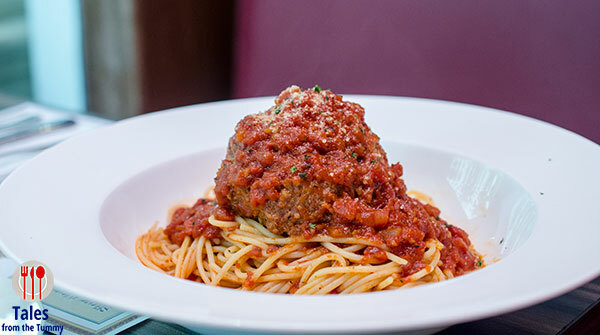 Spaghetti tossed in marinara sauce and topped with half pound meatball. 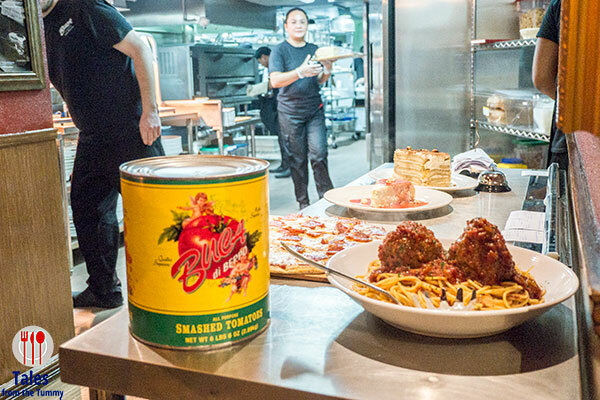 Good tangy flavor from the sauce to balance out the gigantic meaty meatball that was as big as my fist. 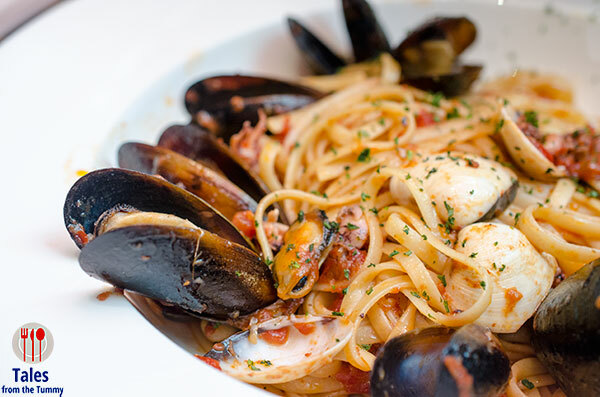 Linguine Fruitti di Mare (P595/small). This is another dish that benefits from the use of fresh seafood, the sauce just tastes sweeter with all the natural juices seeping in. There’s generous amounts of shrimps, mussels, clams, and calamari in spicy (not that spicy) red clam sauce. Lasagna (P2,195/large). When they say large, it’s really closer to gigantic like their house lasagna. Layers of meat sauce with ricotta, mozzarella, provolone and Parmesan cheeses. 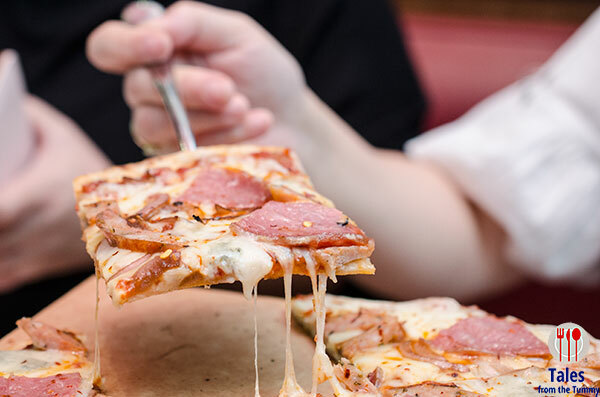 It tastes rich and homey with generous amounts of cheese and meat in every bite. We took home a piece for Lauren and she enjoyed it so much she even brought part of it to school for lunch and demanded we eat there again. We got a small size and it’s already good enough to share among the 3 of us. Prosciutto Stuffed Chicken (P695/medium). 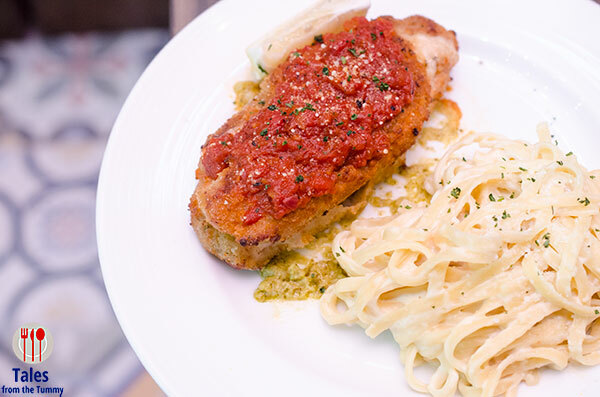 Chicken breast stuffed with mozzarella and proscuitto topped with marinara sauce with pesto cream sauce on the side. Not a fan of this one, flavors were on the bland side and the chicken was dry. I suggest getting the Chicken Saltimbocca (P675/small) instead, which we had on a succeeding visit and it was vastly superior with the tangy lemon sauce. Spicy Arrabbiata Pizza (P775/medium) topped with spicy Italian sausage, pepperoni, caramelized red onions, Gorgonzola, mozzarella, provolone, and house pizza sauce. Good chewy aromatic crust that is strong enough to hold the generous toppings that had a fair amount of spiciness. 11th Avenue cor. 30th St.